They’ve pulled the plug on the family Olds. Now, they’re taking away our chucks. What’s next? Levi’s? Converse All Stars, the shoe that was The Shoe almost a half century before Nike or Addidas or Reebok even existed, announced recently that it was getting out of the shoe manufacturing business. A cultural icon to rival blue jeans or Big Macs, Converse shoes have been part of the Smithsonian National Museum of American History’s collection for more than 50 years. The museum is trying to hunt down business documents from the North Reading, Massachusetts-based company now that the once ubiquitous shoes may become extinct. Ciao, dear chucks, as so many folks affectionately refer to the canvas sneaker that bears the signature of their most famous salesman, Chuck Taylor. They weren’t merely an athletic shoe, either. The Boston Celtics championship dynasty of the late 1950s and ’60s popularized the black high-top version, but this was footwear with crossover appeal. It was the shoe worn by Nirvana’s Kurt Cobain to usher in Grunge, the slip-ons of choice for Iggy Pop and Tom Petty, even Whoopi Goldberg. “I don’t know what I’m going to put on my feet,” said Buck Malen, an Albany musician currently playing with the band Johnny Rabb and the Jailhouse Rockers. “I don’t know what my feet look like without Converse All Stars.” Malen, 50, recalled with a moan that he recently threw away more than a dozen pairs of chucks while packing to move into a new apartment. Strictly a high-top wearer, Malen has owned most of the more than 15 different colors Converse came in, including a checkerboard, multicolored lame pair given to him in 1983 by a friend who was a salesman for the company. More than 600 million pairs of the sneaker have been sold since the Converse Rubber Co. made its first pair of All Stars in 1905. 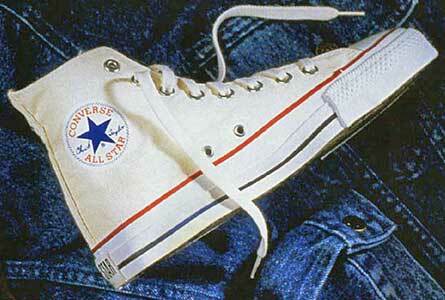 Chuck Taylor, a semi-pro player with the Akron Firestones, went to work for Converse in 1921. His impassioned salesmanship to colleges and high schools across the country led to Converse putting his name and signature on the shoe’s label a few years later. An American icon flourished in the years to follow, a shoe synonymous with both Wilt Chamberlain and “Leave It To Beaver.” But as athletic footwear developed into a high-tech leather and suede industry, Converse’s share of the market diminished. The company announced in late January that it was filing for Chapter 11 bankruptcy protection from creditors and closing its three North American plants. The shoes are still being made in Asia. Local sporting goods stores, such as Klein’s All-Sports, still have both the black and white canvas models in some sizes. According to a Klein’s salesman, the store hasn’t received any of the other colors for several years, and it hasn’t received more of the standard canvas sneakers for more than a year. Lucky charm Barry Kramer, a Schenectady County Surrogate Court judge and among the best basketball players ever from the Capital Region — he was a member of the 1960s Madison Square Garden All-Decade Team — said his white canvas Converse shoes were his lucky charm. He did whatever he could to keep a pair intact, taping over rips in the rubber and canvas. “I was superstitious about them,” he explained. “I held on to them a lot longer than a lot of people would. To me, Converse was synonymous with just playing ball: ‘Lacing up your Cons.’ It was the lingo of Saturday morning basketball.” Kramer admitted that after his brief professional career he switched to black Cons, for decidedly practical reasons. They don’t show dirt and scuffs.